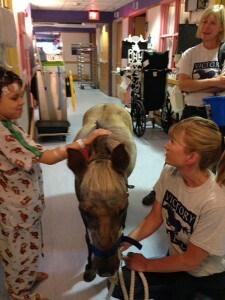 It is not without some heroic effort on the behalf of the staff at Victory Gallop that Petie the Pony makes his weekly hospital visits. But every ounce of energy expended to prepare the half miniature horse, half pony is paid off in smiles, giggles and parental gratitude. Before heading to Akron Children’s from his Bath Township barn, Petie undergoes an extensive bathing procedure. Sue Miller and Kim Gustely, his handlers and co-directors of Victory Gallop, carefully wash his feet and then wrap them in surgical tape to preserve their pristine state. 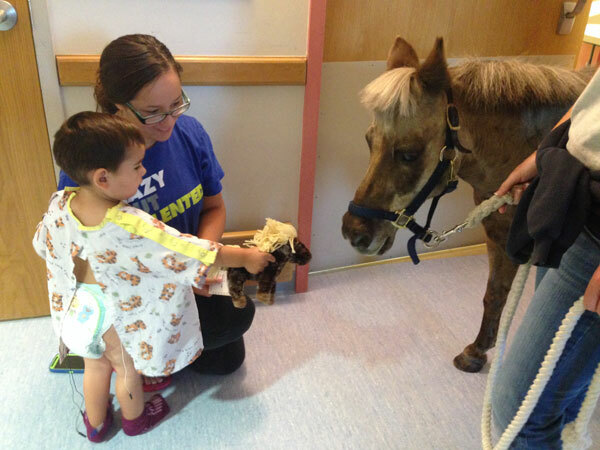 This 22-year-old animal wonder has achieved rock star status at the hospital since he began visiting patients in 1997. Today he couldn’t even make it 50 yards from his horse trailer to the main entrance without stopping for 4 pictures with staff members and 2 more with patient families. 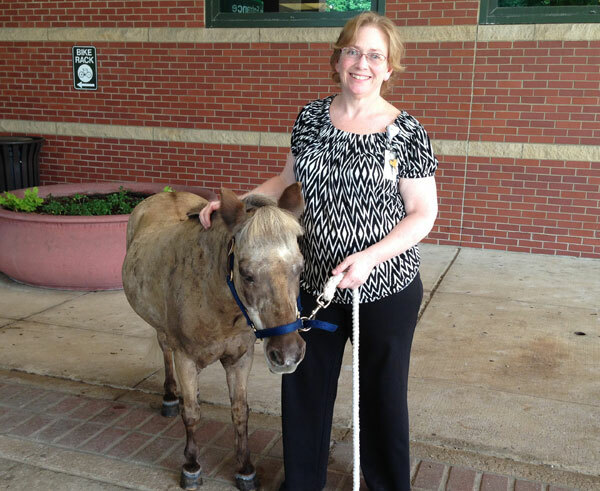 Jackie Fuller, an employee in the Information Services department, was thrilled to be in the right place at the right time. Often he grabs the attention of patients coming in and out of the hospital, and today was no different as he greeted 3 year-old Wyatt Chason, of Masury. Victory Gallop volunteer Toril Simon gave him a stuffed replica of Petie and one of Petie’s trading cards. 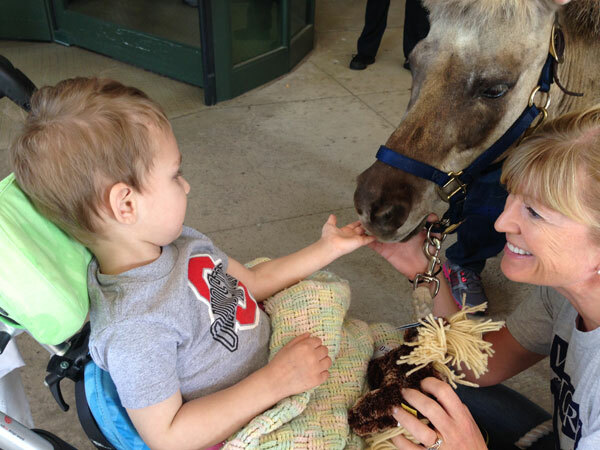 Wyatt was in the middle of an occupational therapy session but happily took a break to stroke Petie’s stately nose. Then much to everyone’s amusement, he was led in through the revolving door at the hospital main entrance and up the glass elevator to the toddler inpatient area on the seventh floor. Everyone lights up when happening upon Petie, and most ask to take a picture of him with their smart phones. But the most heartwarming responses are those of the patients and their parents. Trying to keep a toddler entertained in a hospital room can be a task unto itself. 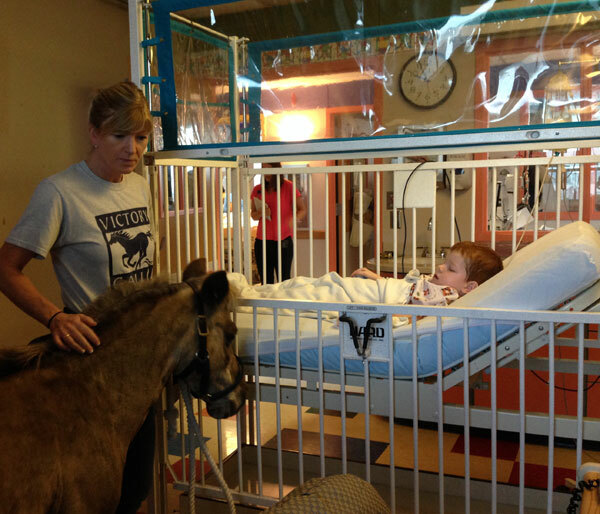 When Toril and Kim asked Ginger Ott if her son Jacob would like to visit with a horse bedside, she was shocked. But there he was, right in her son’s room, peering at him as he rested comfortably in his crib, snuggling with his new stuffed Petie replica. When Petie saunters into the room, the parents’ relief is palpable. Petie offers a fun distraction for their children – and themselves. His calm demeanor soothes their incessant worry about their children. 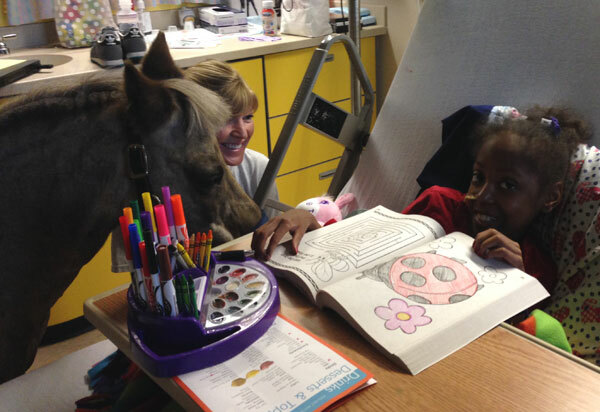 Petie finished up his visit with a doctor-pony selfie with one of the residents rounding on the floor. And then it was down the elevator, out the revolving door, into the trailer and back to his farm. But his stuffed animals and pictures remain back at the hospital, where he’ll be the topic of conversation and the subject matter of good memories for a long time to come. Watch the video below to learn more about Petie’s preparations for his hospital visits.